Jesus is Alive! – These simple words changed the world and announced the amazing truth of Jesus’ Resurrection. This page lists all the Bible verses about Easter, ideal for cards, crafts, or inspiration during the Holy Week. “Don’t be alarmed,” he said. “You are looking for Jesus the Nazarene,who was crucified. He has risen! He is not here. See the place where they laid him. What book of the Bible is Jesus resurrection? The Easter story is perhaps the most well known event in the Bible. For Christians, the resurrection of Jesus is the key event in all of history. Here are some well known and popular Bible verses about Easter. You could build an Easter Sunday school lesson around these Easter Bible verses. These Bible verses and quotes from the Scriptures could also be used on Easter greetings cards, easter decorations or craft projects. Let kids make their own Easter cards with our printable Easter Coloring pages. (1) But on the first day of the week, at early dawn, they went to the tomb, taking the spices they had prepared. (2) And they found the stone rolled away from the tomb, (3) but when they went in they did not find the body of the Lord Jesus. (4) While they were perplexed about this, behold, two men stood by them in dazzling apparel. (5) And as they were frightened and bowed their faces to the ground, the men said to them, “Why do you seek the living among the dead? (6) He is not here, but has risen. Remember how he told you, while he was still in Galilee, (7) that the Son of Man must be delivered into the hands of sinful men and be crucified and on the third day rise.” (8) And they remembered his words, (9) and returning from the tomb they told all these things to the eleven and to all the rest. (10) Now it was Mary Magdalene and Joanna and Mary the mother of James and the other women with them who told these things to the apostles, (11) but these words seemed to them an idle tale, and they did not believe them. (12) But Peter rose and ran to the tomb; stooping and looking in, he saw the linen cloths by themselves; and he went home marveling at what had happened. (9) And as they were coming down the mountain, he charged them to tell no one what they had seen, until the Son of Man had risen from the dead. (46) and (Jesus) said to them, “Thus it is written, that the Christ should suffer and on the third day rise from the dead, (47) and that repentance and forgiveness of sins should be proclaimed in his name to all nations, beginning from Jerusalem. (16) For if the dead are not raised, not even Christ has been raised. (17) And if Christ has not been raised, your faith is futile and you are still in your sins. (18) Then those also who have fallen asleep in Christ have perished. (19) If in this life only we have hoped in Christ, we are of all people most to be pitied. (20) But in fact Christ has been raised from the dead, the firstfruits of those who have fallen asleep. (23) But the words “it was counted to him” were not written for his sake alone, (24) but for ours also. It will be counted to us who believe in him who raised from the dead Jesus our Lord, (25) who was delivered up for our trespasses and raised for our justification. (33) Who shall bring any charge against God’s elect? It is God who justifies. (34) Who is to condemn? Christ Jesus is the one who died–more than that, who was raised–who is at the right hand of God, who indeed is interceding for us. (30) But God raised him from the dead, (31) and for many days he appeared to those who had come up with him from Galilee to Jerusalem, who are now his witnesses to the people. (23) this Jesus, delivered up according to the definite plan and foreknowledge of God, you crucified and killed by the hands of lawless men. (24) God raised him up, loosing the pangs of death, because it was not possible for him to be held by it. (14) But you denied the Holy and Righteous One, and asked for a murderer to be granted to you, (15) and you killed the Author of life, whom God raised from the dead. To this we are witnesses. (11) If the Spirit of him who raised Jesus from the dead dwells in you, he who raised Christ Jesus from the dead will also give life to your mortal bodies through his Spirit who dwells in you. (20) that he worked in Christ when he raised him from the dead and seated him at his right hand in the heavenly places, (21) far above all rule and authority and power and dominion, and above every name that is named, not only in this age but also in the one to come. (11) In him also you were circumcised with a circumcision made without hands, by putting off the body of the flesh, by the circumcision of Christ, (12) having been buried with him in baptism, in which you were also raised with him through faith in the powerful working of God, who raised him from the dead. Paul’s Summary of the Easter Story in 1 Corinthians 15:3-8. (3) For I delivered to you as of first importance what I also received: that Christ died for our sins in accordance with the Scriptures, (4) that he was buried, that he was raised on the third day in accordance with the Scriptures,(5) and that he appeared to Cephas, then to the twelve. (6) Then he appeared to more than five hundred brothers at one time, most of whom are still alive, though some have fallen asleep. (7) Then he appeared to James, then to all the apostles. (8) Last of all, as to one untimely born, he appeared also to me. (15) Jesus said to her, “Woman, why are you weeping? Whom are you seeking?” Supposing him to be the gardener, she said to him, “Sir, if you have carried him away, tell me where you have laid him, and I will take him away.” (16) Jesus said to her, “Mary.” She turned and said to him in Aramaic, “Rabboni!” (which means Teacher). (17) Jesus said to her, “Do not cling to me, for I have not yet ascended to the Father; but go to my brothers and say to them, ‘I am ascending to my Father and your Father, to my God and your God. 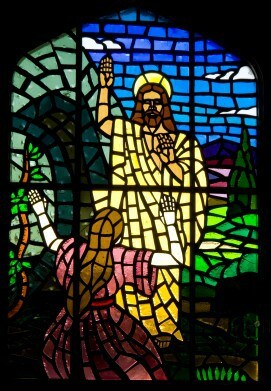 '” (18) Mary Magdalene went and announced to the disciples, “I have seen the Lord”–and that he had said these things to her. Jesus Appearing To Doubting Thomas in John 20:24-29. (23) and when they did not find his body, they came back saying that they had even seen a vision of angels, who said that he was alive. Leave me a comment if I’ve left out your favorite Bible verses about Easter. Tony Kummer (Editor) reviewed & updated this page on : April 20, 2019 at 2:36 pm. All our content is peer reviewed by our readers, simply leave a comment on any post suggest an update.